It’s so enjoyable writing good reviews. It is valuable to write balanced, semi-critical pieces of course, and this is a core part of Permanent Style. But you always feel very conscious of the effect the criticism will have, and bad even if it’s accurate. 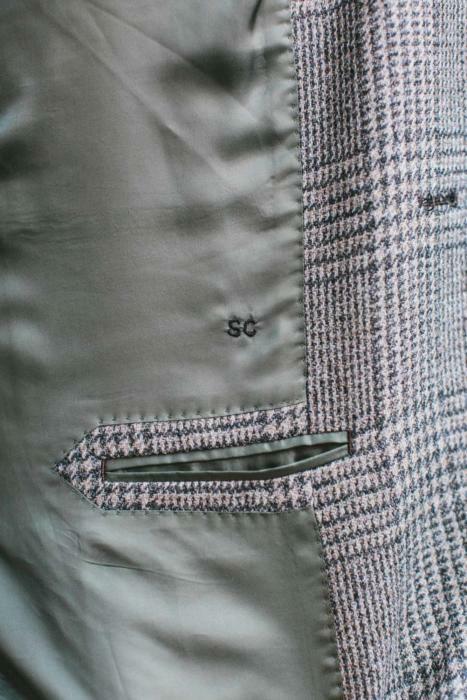 Enjoyably, there is almost nothing bad to say about this Saman Amel made-to-measure jacket. It is simply superb, in terms of style, fit, craft and value. Which is even more pleasurable to say, given what lovely people Saman and Dag are. I first wrote about Saman Amel in September 2017, when they first came to London. They’ve been here another time since (when we had the first fitting) and Saman is here next month again (February 8-10). I say fitting, but given this is made to measure and not bespoke, the jacket was pretty much finished at that second meeting. Nothing was basted, with any adjustments requiring opening up the seams. This restriction of made to measure is one reason Saman says he takes the measuring process so seriously - and that showed at this second meeting. All the fundamentals were perfect - the balance front and back, side to side, the clean close fit around the neck. I don’t think I’ve ever had a piece of tailoring that fit this well at this stage. The only things we changed were to balance the sleeve length and put a little more shape in the back. The jacket was sent a few weeks later, and I showed it to them in Stockholm when we met at the atelier. It was perfect. As per usual, the photography here doesn’t necessarily do justice to the fit. Until you start moving (or the wind starts blowing) the fit is beautiful and clean through the waist, for example. And you can see how lovely it is in the back - below. (Bear in mind also that this is a very soft, lightweight jacketing - Loro Piana wool, 320g). The only thing I might change is to give a touch more space in the waist. It's perfect over a shirt, but doesn't give much room for a little knitwear (as here). Often adding a bit in the waist like this doesn't visibly change the line, but allows the jacket to hang a little more easily. Making jackets tighter even if it doesn't slim the lines is a frequent mistake men make with bespoke or MTM suits. These fit points are important, because there are also cheaper jackets in the Saman Amel range that would fit just as well, but involve less hand work. My jacket is from the Neapolitan line, which starts at £2200 for a two-piece suit. Jackets start at £1800 and mine (in Loro Piana cloth) was £1950. But the Toscana line starts at £1400 for a suit, and there is even a business-suit range with limited cloths at £1200. The major difference with the Napoli line is that it has hand-padded lapels, which give a touch more shape to the chest (albeit less that with most English suits, given the lightweight canvas). The other handwork in the Napoli line includes hand-attached lining, -sewn buttonholes, -attached buttons, -sewn gorgeline, -picked stitching, and -attached pockets. Plus the functional work you’d expect on any good MTM or RTW suit, such as a hand-attached collar. Many of these things will be points that Permanent Style readers like and will value. But for others, the Toscana line is a great option. In terms of style details, it is noticeable how Saman pitches the top of his patch pockets forwards, which makes them more functional (above). Round Neapolitan patch pockets look lovely, but can often be impractical given the narrowness of the opening. A slanted top solves that problem. The shoulder is very soft but slightly extended, which gives a subtle impression of width without more padding. The chest is fairly clean and close, and the lapels wide. In fact, the one thing I would change about the Saman Amel style is the gorgeline, which is very high and - as a result - makes the wide lapel look even wider. It's also striking how open the foreparts are (below the waist button) but relatively straight - not as curved as some Neapolitans and in keeping with the line of the lapel. An unusual aspect that was picked up on Instagram a while ago is the strip of lining Saman has included underneath the two vents (above). This is intended to keep the two sides of the jacket together, and keep the vent in place, when you put your hands in and out of your pockets. I was initially sceptical about this. It reminded me of those horrendous shirt stays that attach to your socks. But actually, you never see this strip when wearing the jacket, even when putting your hands in and out, and it functions perfectly. It’s something Saman would only use on those with a big seat, and it is an issue I occasionally have - no matter how much the vent overlaps. As discussed in more depth on the first post on Saman Amel, their styling is also a big attraction. Both Saman and Dag are very fashion aware, and their monotone aesthetic of grey, cream, brown and navy feels very grown-up as well as very modern. Their input on the cloth selection, as well as the brown corozo buttons and green lining, was useful. I’ve also tried the made-to-measure knitwear (which I will write about separately) and am rather taken with the cut of the cashmere hoodies, which are more formal than most despite their raglan sleeve. Lastly, I would say that I am very happy with the cloth selection. I've long wanted a Prince-of-Wales sports jacket with a touch more texture and some brown in it, to make it a more suitable jacket than my Anderson & Sheppard flannel. 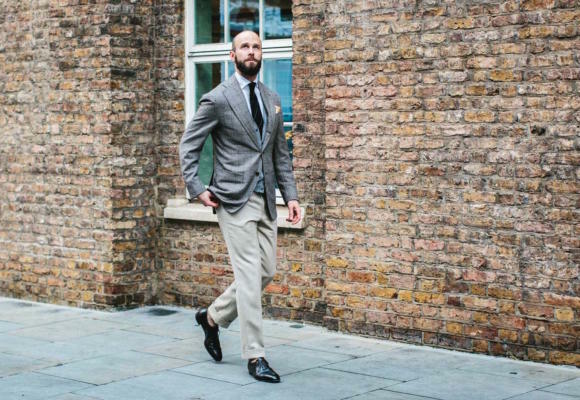 The disadvantage of a grey jacket, of course, is that it cannot go with grey trousers and so is limited to charcoal, cream, green and then tans/browns. But I think that will be enough. Cloth: Loro Piana, Jackets and Trousers – Collezione 627 bunch, 320gr/mt, 100% Super 120's wool. Saman is back in London for the next trunk show on February 8-10. Appointments can be made through dag@samanamel.se. There aren't many appointments left for those days, but they will be back again two months' later. You can follow the discussion on Saman Amel made-to-measure jacket: Review by entering your email address in the box below. You will then receive an email every time a new comment is added. These will also contain a link to a page where you can stop the alerts, and remove all of your related data from the site. Nice. Agree about the gorge. Also question buttoning stance, which appears to be on your sternum. Well put about the garment, as well as the humble guys behind the brand. Wouldn’t expect anything less from Dag and Saman. Brilliant! The jacket looks very nice but I do question the price. There are many bespoke options at that price point. Agree, though few this good in terms of style and fit. The best case from a value point of view is the Toscana line from that point of view. I can think of several UK based bespoke tailors who can make a coat by hand for this amount or less. Absolutely. As I say, though, many of them would lack some of this hand-finishing (eg lapel buttonhole) and I’d wager pretty much all would lack the style. Just to test this point a bit more, I think you could get a Solito bespoke jacket for about that price. Given the choice between the two, do you prefer Saman Amel to Solito? Interesting you mention experience. You’ve said one of the benefits of bespoke (even with makers with whom you have a well-developed pattern) is the fittings to ensure everything is right. Do you feel your “pattern” with Saman Amel is well-developed enough (including incorporating the tweaks made during subsequent visits) that you would be able to make future orders without any changes? That is to say, will the process for future orders be more akin to ordering shirts, where you select a fabric and receive a fully satisfactory finished product? Do you feel confident this could be achieved? I feel very confident in the pattern, given how good the fitting was and (particularly) how fastidious Dag is about maintaining and updating records. (Something traditional tailors sometimes fail to do in a paper-based system). But I would still always want a fitting on a piece of tailoring. Cloths are different, wool moves more than cotton, and the piece as a whole is more complicated than a shirt. At this price you can get a bespoke 3 pieces suit at Whitcomb & Shaftesbury, going outisde of the base fabric range. Granted it wouldn’t be napolitan style, but it would still be bespoke. Looks really nice. I particularily like how they make classic tailoring look so modern. I really like them and just ordered my fourth napoli suit. In the beginning they just have Italian cloth but now they also have rustic British cloth like Fox, Minnis and Dugdale. Happy but not surprised to see that you’re happy with your jacket. Looking forward to reading your thoughts on the knitwear program. Saman and Dag truly provide excellent service and products throughout, following up on how you like the clothes and how they feel. For instance, a few months ago I was contacted by Dag, just asking how things were and checking whether I was still happy with my commisions from about a year earlier. As a customer I value and enjoy these kind of interactions, which not only deepens the relationship between clothier/tailor and customer, the ongoing conversation also helps with small improvements and ideas for future commisions. Plus it’s always fun to catch up and discuss non clothing related stuff too, there is a life outside of the bubble after all. Very nice. I think Saman and Dag proves that premium MTM can be an excellent alternative to Bespoke in terms of fit and make. Couldn´t be happier with my two pieces from them. Whilst there’s no doubting the excellence of the jacket the price point does raise questions. Being as this is MTM at a bespoke price point the discussion needs to be does this MTM top a bespoke jacket ? I think it’s fair to say that while some bespoke could be at this price, the vast majority is not. Outside, say, Whitcomb & Shaftesbury, there is very little bespoke that would have this level of finishing. And there are obviously separate economic reasons for that. Simon you need to know where to look. Given you never review any tailors outside London, your point of referance is very narrow. Plenty of real bespoke work going on at that price. And I agree the button stance is wrong. If your belly button is in that area then your trousers are very low waisted. I don’t review many tailors out of London precisely because there is not much variation – in terms of style, approach, or anything else worth commenting on. Friends that have used such tailors (more than 30 between them) confirm that the only selling points really are price and location. 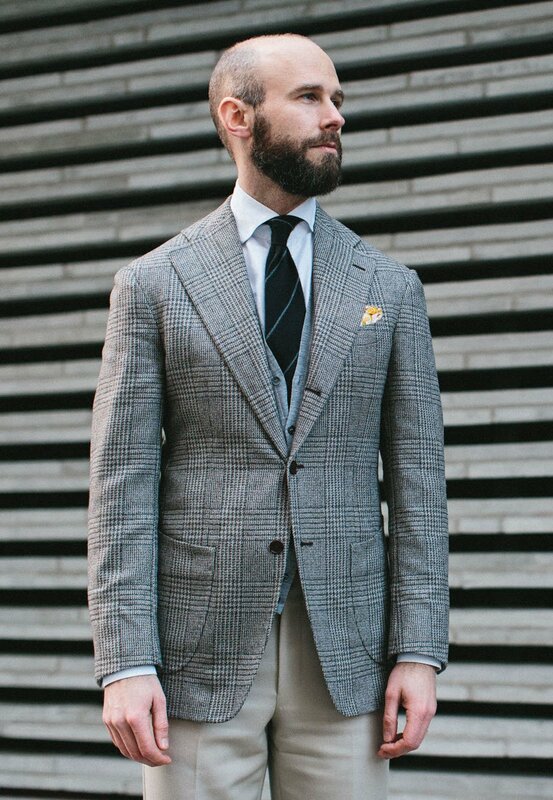 I wouldn’t have them make a soft-shouldered Italian-type jacket like this anymore than I would with a Savile Row tailor. Or have them comment on style, help build a wardrobe etc. I would with Saman and Dag. So my guy is obviously not one of your 30. He copied a Rubinacci for me (and actually ended up doing a better job), threw in a Milanese buttonhole, all for less than your MTM. Think I should keep his name to myself….. Thanks. Well, feel free but I’d be interested to see that. and built up a reputation for, why not just head to Asia? Perhaps it’s easier to remain anonymous if you never venture out from behind your laptop. Simon, I wonder you continue to post criticism of your work from anonymous posters, most seem to be looking for an argument rather than having a reasonable discussion. I know what you mean Guillaume, and of course you never see the comments I don’t publish – two overnight I deleted because they were purely critical with nothing substantive to add to the conversation. I do feel this one added something, but it is a fine line and I always have the general reader’s interests in mind. I am very satisfied with my Toscana line suit and would recommend to anyone. Not only the suit but also the nice warmth and humour that will meet you when you enter their studio. Only issue is Dag is supporter of Djurgården 🙂 (dont ask). Very interesting, Simon. I hadn’t had the chance to see their product first-hand so that helps! How would you rate that compared to Orazio Luciano MTM for instance (whose price varies between retailers but can also be found in this price range)? Can you elaborate on the buttoning on the piece? It looks as if it have 3 button holes but is cut as a 2 button rather than a 2 roll 3. Am I missing something? Good point – it’s a 3 roll 2, but a slightly more extreme version; there’s not too much roll, though more than the pictures perhaps suggest. Very interesting piece, thank you. Have been wanting to try Saman Amle for a long time and now I definitely will. I have a suit from their business line and I am very pleased with it. Birdseye navy cloth. I originaly chose a fabric from the limited business bunch, but it turned out it was out of stock so Saman gave me the choice of a more expensive fabric – without any extra costs! I think either style of jacket will work with jeans. I have a quite “English” bespoke SB blazer which looks great paired with beaten up 501’s, espresso suede loafers and a simple white shirt. Thank you Simon and Nick for your views. I agree that for this price you could (or at least almost) go bespoke. But when you consider mutliple travels and waiting time of 3/4 year or so that price can easily explode. In my opinion the biggest benefit of bespoke is a certain feeling you get with it. It’s hard to explain to a outsider or could seem foolish. 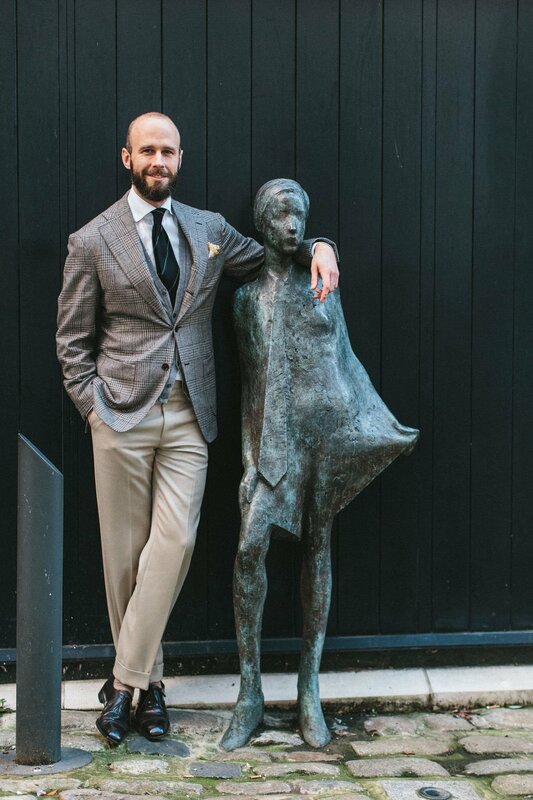 As an example I’ve letten a MTM-Maker copy a pair of my bespoke trousers from my tailor. In therms of fit you wouln’t spot a difference. Same thing for a MTM-Jacket I have from Orazio Luciano. Fit is great, Finishing too. But with both of these I don’t get the feeling I get when wearing a bespoke suit from my tailor. There is something with it words can’t explain. Call me nuts. Exactly. We would certainly agree that fit and how it looks is the most important thing . This can easily be achieved by MTM. 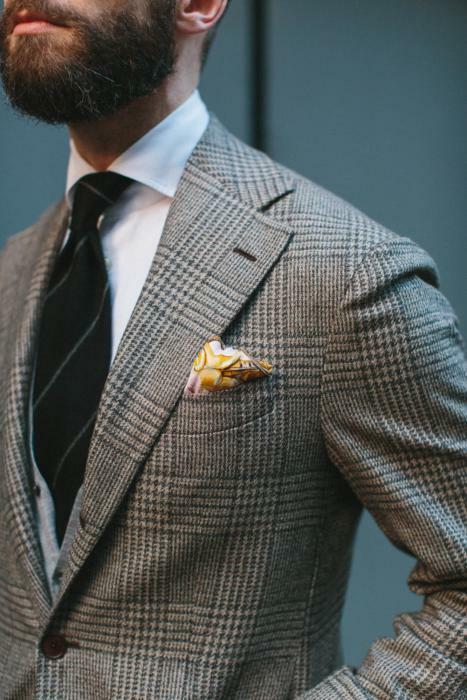 Regarding the lapels, how flexible is Saman Amel on the style? Can you request a lower gorge and/or a slightly narrower lapel, or are these fixed? Good question. I should have put this in the piece – they can adjust the lapel width quite a lot. Generally, what I have is as wide as they would go. The gorge can be a little lower too, but not a lot. It looks relatively higher on mine because of my sloping shoulders. So glad the MTM service worked out well for you, Simon! Would you say that Samanamel is comparable to Orazio Luciano in terms of fit and make, given that you’ve tried both? They seem quite similar to me construction-wise, just with different styles. Ooops my bad. Any plans to try them in the future? Been a customer for years with these guys. I have a suit, a shirt, a pair of trousers and some knitwear. Planning on getting my next suit this week. Nothin but good things to say. The fit looks perfect and the style is quite unique, both so much that I would thought this was bespoke. It’s not to my taste, but it’s rare to see MTM with so much character. Though it’s not so different from the price of bespoke, the end product is hardly different. If you can get something like this from MTM, the method of achieving it is less important. I don’t mean this to be an endorsement of MTM over bespoke, just that in this case bespoke could hardly do better. It is worth mentioning that their product is fully made by Munro Tailoring. Their ordering systems, master garments are all Munro. They don’t have any contact with the workshops, because Munro won’t let them. Same for P. Johnson, all through Munro, only they are partially owner of Sartoria Carrara. Their top line is exactly the same as Saman Amel’s. It only comes down to taking measurements. Patternblocks, mastergarments, ordering system are all the same. Since so many (and I’m talking A LOT) retailers are supplied by Munro, with the same product, it all comes down to skill. Which they clearly have. I completely agree that the most important thing is the taking of measurements. However, you are wrong on several points. SA don’t go through Munro for communications, and talk to their two different facilities independently. The SA garment is hugely superior to the top-line of P Johnson (I’ve had both, obviously) in terms of quality, style and finishing. And in both these ways their relationship with Munro is very different to other brands. Very nice jacket indeed. And very nice as it is and looks now. 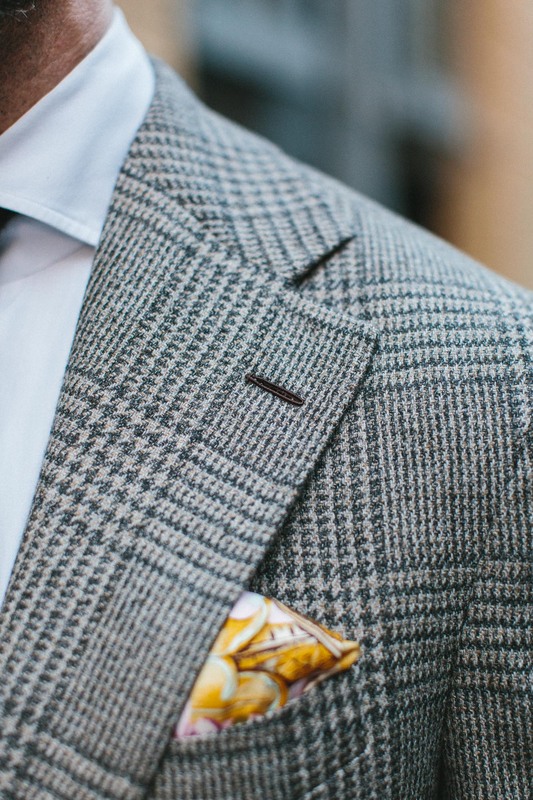 I can’t explain though… but what about peak lapels? Too vintage? A bit rakish jacket, but a lovely one! I’m amazed by the kind of innovations that have been incorporated in it! This is a reminder of how a very classic item such as a jacket is still being improved in terms of make. So to you this jacket would be “more suitable” than your Anderson & Sheppard DB. Are you really sure of this propect? Any chance you could find the cloth number for the cav twill trousers? Interesting. Excellent shape at the back – one of the best yet. Sleeves (often overlooked) are also beautifully cut – perfect length, pitch and cuff shape/angle. The transition from sleevehead to shoulder is another feature – given your sloped shoulders (no insult or slight intended) the shoulder shape is also excellent. Issues are the buttoning (a little too tight which throws the button), the lapels are a little wide (I’d be interested in your view of the notch angles) but the patch pockets are awful. The rim angle bows the line out making you look a little pot bellied and odd. Logically, if access were to be easier, the angle would be the reverse (to match the anatomic angle of the hand/forearem – as with every other casual jacket). Lastly, as with others, I take issue with the sweeping judgement that UK tailors can’t achieve this look. It is poor journalism as it is an unsupported supposition undermined by your normative practice of not commenting on something unless you have direct experience – and there are hundreds of tailors across the UK. It also doesn’t look good that you will not venture outside of central London to investigate? – On the UK tailors, I have tried several that have tried to make a Neapolitan garment (including Graham Browne, Thom Sweeney, Gieves & Hawkes, Richard James etc), seen personally the attempts of about a dozen more, and as I said been given detailed reports by friends that have tried over 30 around the country. The opinion is certainly not unsubstantiated, even if not all of it is personal experience. There can’t be many that could have greater basis for commenting. The fundamental point is that, unlike Italy, England does not have various different schools and styles of tailoring. All those UK tailors around the country derive from the same traditions, have the same training in the same places, and so on. They are all taught to cut within a relatively narrow range of styles, and all of them are a long way from Neapolitan in terms of not just make but (much more subtly) cut. It’s hard to find an argument why not seeing those tailors around the UK means I’m missing out here – that they wouldn’t have the same issues and barriers as the many tailors on and around Savile Row who have attempted this. Happy to be proved wrong, and I appreciate your point that I always try to experience everything in person. Sorry, that wasn’t quite clear. I’ve seen closely a piece being made, and seen several on the cutters. As with most English tailors making that style, they largely soften the padding and shoulder, and do a spalla camicia on the sleeve. But everything else is English – the shape of the lapel, of the rest of the front edge, the pocket shapes etc etc. To copy these is a question of learning to cut different shapes, curves and angles that you don’t normally get in English tailoring. It is perfectly possible to do – BnTailor have done a good job, as have the guys doing Prologue, even the Armoury/Ring Jacket to an extent (although there Ring Jacket were helped by having someone running the factory that had been at Kiton). But it’s more complicated and subtle than most people think. You need someone trained in that discipline, or to start taking apart jackets and copying the lines. From this discussion it seems to me that if demand is great enough one of the Neapolitan tailors might think of trying a shop in London. Maybe a pop-up shop for a period. Or a UK house might go about developing the expertise to cut and make in the Neapolitan style. Ah the benefit of local knowledge. Do you think one of the UK tailoring houses will try to develop a Neapolitan addition to their style? It seems like they are letting a line of business drift past. And if the trend to less formal tailoring continues it may become a matter of survival. A lot of them are trying and have tried, that was my point. I haven’t seen a good one yet, in the sense of being very similar to it, but the things they have created are still very nice in their own way – as with my Richard James jacket. What a superb jacket! Saman Amel definitely deserves this high praise. A point on the gorge: it might just be the way I see the jacket in the photos, but perhaps it’s the angle of the opening that appears too high. This was a great review! Loved hearing what you have to say about these guys! Was wondering, since I live in a part of the US that will never see a tailoring trunk show, what you were your thoughts on their cashmere hoodies? What would you wear them with? Are they versatile? “Hand attached lining”: is it the same as saying hand sewn? I am asking because whenever you mention Cifo and Camps finishings, you mention two steps, one is sewing the other is…attaching?? I seems like to closest competitor to Saman price wise, who you have tried, would be Whitcomb & Shaftesbury. How would you compare the two with regards to fit, make and value? Also, what is the style of Saman’s trousers like? 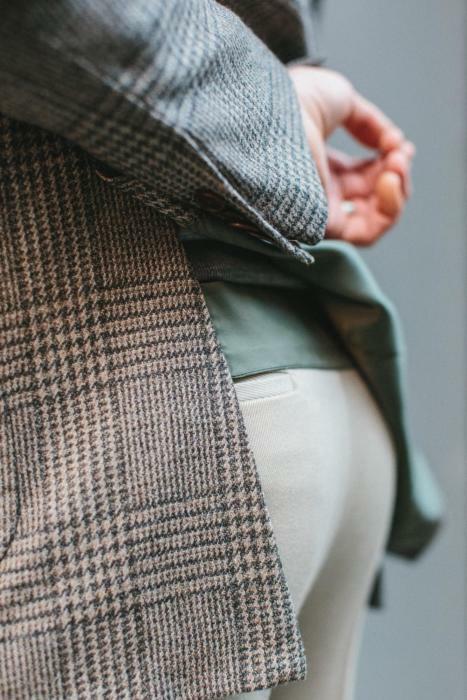 From their website it seems like they tend to make wider pleated trousers, but could they also make a straight slim flat fronted trouser as well if that is what the customer desired? I haven’t tried the trousers, but yes they can make different styles. Whitcomb and Saman are different in every way except the price – and I think should be seen as two very distinct choices. The first prioritises classic tailoring, bespoke fit and make, and more formal traditional style. The second softer make, more modern style (more style overall) and much more casual, Italian cuts. Thanks for the reply Simon! Would it be safe to say then that, for someone whose budget is in this price range, one could expect to use Whitcomb for things like more formal suits and evening wear, and Saman for more casual suits (linen, cotton) and jackets? I have had traditional trousers made by Saman, both with flat front and with pleats. I am pleased with all of of them. The jacket seems a lovely fit, but I see what you mean about the lapels: it makes it look a little Ron Burgundy-esque. Do forgive me if I missed this but where is each line manufactured? Made at different facilities in Italy, with Munro helping with ordering systems and logistics. As covered in the previous post, however, and in a comment above, the way they use Munro is very different to most other brands, and the Napoli product is hugely superior to P Johnson in terms of make and handwork. And is the Napoli product also made in Italy, through Munro, or does the Samanamel team actually makes (part of) the suit? No they don’t. All in Italy, through Munro, different facility to Toscana line. It would be great with an article about Munro and how different MTM brands work with their suppliers. For example in deciding fit, style and level of handiwork. And eventually compare them to Caruso, Edesim,… also I am not sure what their connection to Suit Supply is. Same shareholders? After looking at their website I can add to the praise: the photography is outstanding, even inspiring. But nothing about coats even though I there are some pictures of their coats on other sites. Do you know if they still offer any? I think that they still offer coats in their MTM programme. I have a double breasted polo coat from SM that I love. It’s good that you’ve included a rear three-quarter view which I’d like to see more often in reviews. 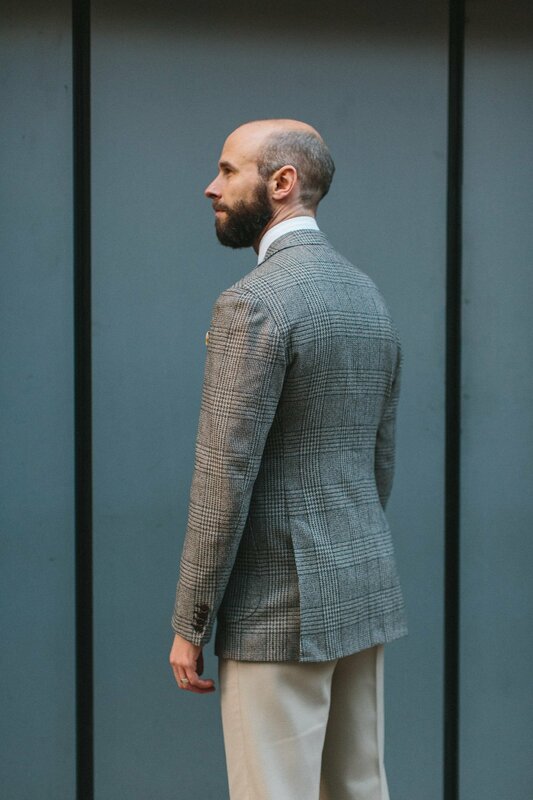 Of course the front is always important but a shot of the back can reveal a great deal about a coat and its tailor. Collar fit, shaping over the upper back and into the waist then down to the hem can all be assessed (even allowing the usual caveat about judging fit from photographs). Not a criticism as the photography is always excellent here; rather a plea for a view that is often neglected across the industry. Good point Ian, and I agree (with that caveat). Personally, I’d also like to do more 3/4 or 1/4 shots, rather than just front, back, side, as this is often where the real shape of bespoke is shown. Have been ordering a few things from SA and the thing that strikes me the most is how fast and clear their communication is. 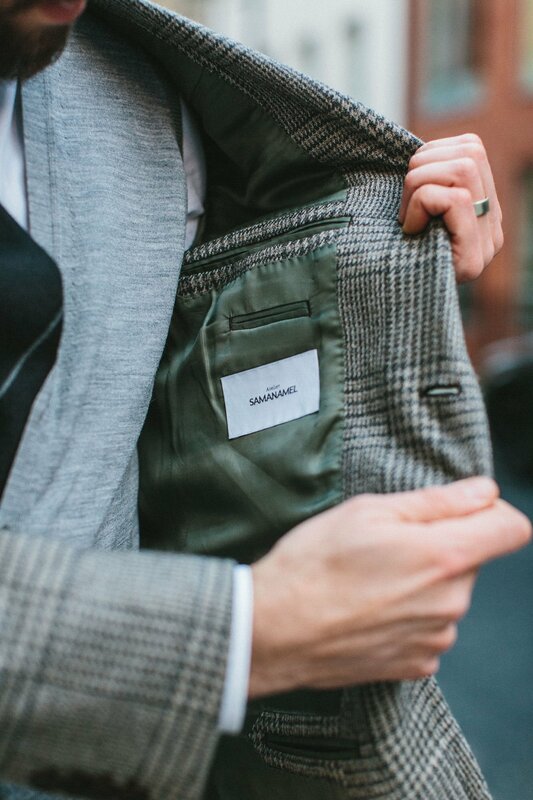 I’ve heard so many stories of tailoring brands doing custom made that seem to forget about that aspect (which is one I value highly). What’s your perception of this Simon? Of course brands might pay extra attention to you, but what’s you general perception, do tailoring houses forget that service (and not just product) is a big part of making a customer content? Absolutely. That sense of customer experience has been lost generally – at designer brands, in department stores – but with tailoring houses the key problem is that they don’t appreciate that they are offering a luxury product that should have a luxury experience around it. That doesn’t mean fancy packaging, it just means time spent on communications and establishing a relationship with the customer. Too many of the bespoke houses still see themselves as nothing more than craftsmen. – saying that MtM cannot reproduce the 3D fit of bespoke is to be reconsidered.? Your responses have been very good to the issues raised. To understand why the Italian style (and particularly Neopolitan) is so popular it occurred that with warmer offices and less social formality the Italian style is more suited to current society. The more formal, heavier and structured English cut less so? Also, as Italians are generally shorter and slimmer the Italian cut is more flattering for the slimmer (perhaps more youthful) figure – and hence more likely, currently, to be considered fashionable. I know you have a number of these jackets as single pieces Simon but will you commission more suits in the Neopolitan cut (in a lightweight wool?) for warmer months? Great article Simon. Thank you. You would choose a SA jacket over a Solito jacket based on style or quality or both? Also, have you seen the Cifonelli MTM, how does this compare? Does SA use the same facility as Cifonelli MTM? Perhaps an interesting alternative to bespoke. I like the cut and love the lapels. One thing I absolutely hate is the slope of the patch pockets. This is a horrendous mistake, is extremely gimmicky and completely ruins what would otherwise be a classic peace. I’m surprised you allowed this. With regards to the price point – personally for a garment of this quality, I think it is very competitive and they certainly offer more opportunity for personalisation than say Zegna MTM. One question I would have is do they have the selection of cloths? Interesting how strongly people have felt about the pockets. I don’t mind them at all. Might be worth mentioning you can also provide your own cloth and have them make whatever garment you want out of it. Simon, what are the shoes you’re wearing in the picture? Are they black? Ive got some cream trousers but I hesitate to wear black shoes with them. This is a problem as most of my shoes are black! Whats your view on this? Thank you for your excellent review. I was very happy to see this post because I recently received a MTM jacket from Ring Jacket in the exact same cloth. My question is more about the fabric. I love your pairing of the jacket here with the Drake’s x PS tan twill trousers. Just wondering what other trouser and shirt/tie combinations you have in mind for this jacket. I love the color, too. It looks gray in some light, but I actually tend to think of it as a kind of “sandy glen check.” You wear it well! Thanks. They is some tan in the check. Hi,how much shorter is this jacket than say a “classic” Savile Row one?Perhaps,it is just me but it certainly looks it. How long (back length) is this jacket? And how long is your brown Caliendo vintage tweed? Good morning Simon. As a professional it is always easy to fall into the trap of making disparaging remarks about other Tailoring houses ( one the less endearing features of the trade). 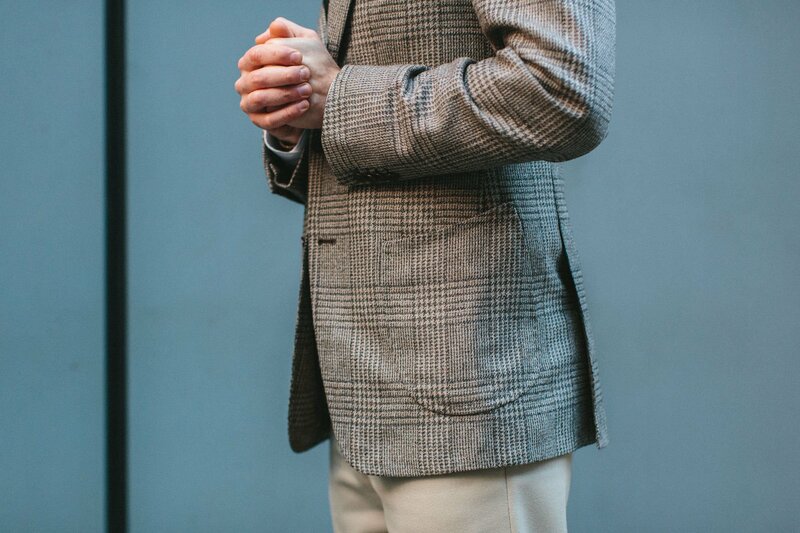 The style of the jacket and some of the technical details such as the high gorge line require considerable levels of technical skill and also note that the lapel is button two roll three which requires a slightly wider lapel and you have to accommodate enough of the check to balance up the the central aspect of the coat. I am not a lover of side slits or that particular style of patch pocket. A tight overlap is a characteristic of Italian Tailoring generally. Overall I think it is an excellent piece and I am sure one you will enjoy for a long time. Thanks for the review. I agree about the gorge height and lower fronts needing some work. I’d think the patch pocket opening would slant the other way to be most accessible. I do like SA’s monochrome style though. What are the advantages of open foreparts? Isn´t it problematic that more of the shirt is revealed? Nice Jacket. The breast pocket should be patched too. Now it is neither meat nor fish. Simon, I am new to your site and apologise for posting off topic but I was uncertain where else to raise my question. In short, I am planning a trip to Naples soon and am keen to see visit a few less well known (but old and established) tailors, shirtmakers and tie makers. Can you give me any pointers? Have you looked at our shopping guide to Naples, Marc? I don’t think you’ve tried Eidos MTM but you certainly have seen many examples of their work. Do you think Eidos is comparable to Saman Amel? Which would you choose and why? Have you been considering them? Simon, didn’t you order a pair of Eidos linen trousers at a trunk show at some point? I think you mentioned it in the piece on stoffa? If you’re thinking of Eidos MTM through Marcus Malmborg I would strongly advise against it. I waited for almost a year, for a MTM suit I never received, before he offered me my money back. Several others have had the same bad experience as me. If I could choose again, I would go for Saman Amel. what was the reason given behind not receiving the Eidos MTM product? I was thinking of having a MTM suit made with them as I liked their ethos and style. Seems strange that they just didnt make it and returned good money to a customer who was willing to pay for something. Even though he claimed the suit existed and that he had received it from the factory, he had a new explanation every week for why he wasn’t able to pass it over to me. I won’t go into details, but after several months with different explanations and excuses everytime I asked for the suit I’m starting to think it never existed. He certainly managed to send lots of RTW stuff to other people during the same period…. If you check the google reviews of MM, you can see others with the same experience as me. thats bizzarre. I suspect from what you say that the factory didn’t do the order, perhaps as they were busy with something else, MM sounds shifty though for making up excuses. I dont mind if ppl say “look im sorry this has happened …” but I dont like Bs artists, as they who knows what else they’ll lie and misrepresent. thanks for the shout anyway. Great looking jacket Simon. What is your standpoint on jetted pockets on sportcoats? I really like the clean look around my waist area, and I think it does draw less attention to my hips (pretty wide). Do you know any cons? less casual perhaps? Yes, a bit less casual, a bit of a look. And can bag open a little if used. But I like them too. A nice compromise is to have flaps but just tuck them in. Are the lapels double stitched, like the patch pockets? Hard to see. Currently wearing and thoroughly enjoying one of several MTM knitwear pieces from Saman Amel. Any update on as to when we can read your experience with it? Been delayed on photos, hope to shoot in a couple of weeks with some trousers that are being made too. Hi Simon, would it be possible to get the fabric number? You’ve inspired me to commission a Neapolitan jacket in the same fabric! Hi – it’s a seasonal cloth so no longer available I’m afraid. Thank you for getting back to me – just found your website and it is leagues above anything else on the internet. Big fan of your vision & work! Is there any other gray Prince of Wales fabric that you’d recommend around this weight range? I found a 250gr/mt Grey Prince of Wales fabric from Loro Piana from the S130 Jacket Bunch (647012) to use in a Neapolitan soft jacket but fear it might be too light to have sufficient drape. I am drooling over your BNTailor yellow tweed & Permanent Style tweed odd jackets…those two fabrics are perfection. I am eagerly awaiting Holland & Sherry’s new tweed bunch! I’m currently considering the 627 bunch for a jacket (same composition/weight as yours). I was wondering if, half a year on, you had any updated thoughts on the cloth? Do you have any concerns over durability? I found the handle of the cloth to be incredibly soft. I feel a fully lined jacket in this cloth should do well for many months of the year in the London climate. Perhaps as close to a 4 season as one can get. Hi Simon, I am considering having a jacket made but confess I am a little put off by the cost (I appreciate well made things but struggle to justify “extravagant” purchases – happy to buy common projects, but struggle a bit more with expensive suits for work or items I don’t feel will get regular use). Despite that, I am considering having a jacket made by SA in their Toscana line following your positive review and the fact that it seems comparatively more aaffordable (perhaps in the Caccioppoli jackets 380101 cloth included in your summer cloths article). Is it just as simple as emailing and ask if they carry the cloth? Is there anyone else you might recommend for jackets – with an eye on cost? Could you provide the collection and fabric # for the SC? The pattern is called a glencheck, correct? I like the spacing of the squares – I’ve seen glenchecks with the patterns more compressed and tight, making it too busy for my eyes. This particular pattern is very visually pleasing! Hi Simon – have you had anything made by Anglo Italian? Heard great things, would be interested in your take. Hi Simon. Beautiful jacket. Also very natural looking glen that doesn’t peacock at all – at least from the photos and how you wear it. I have 8 Neapolitan jackets all in conservative colours (navy or grey), patterns (plain, herringbone, Donegal). I guess my concern has been there is more to go wrong with glen – resulting either in something too old fashioned, or too loud, or too subtle it becomes formal. Somehow you have stuck the balance here perfectly. Any considerations for glen / PoW newbies on critical variables and relationship with formality and suitability for jacket vs knock about suit, eg: background colour, glen colour/contrast with background, size of pattern, surface interest. Gratefully. Hi. I know what you mean about glen checks. If you have a lot of conservative tailoring, though, I guess there’s not too much of a problem if you get it too subtle. It would just be a texture/pattern like herringbone or donegal. One thing to bear in mind is the size of the check – bigger is more casual. So perhaps go for a bigger check (as this one is) in more subtle colours with less contrast. The other piece of advice I’d have is to go for softer, more casual colours. So not black on white, but dark brown on cream perhaps, or with some brown or tan in the pattern (as this has). Very helpful thanks so much Simon. I think I am ready to take the plunge. Lastly is Caliendo still your No 1 Neapolitan tailor for sports jackets? I am beyond happy with jackets from Elia but wondered if others had taken the top spot in your rigorous rankings.